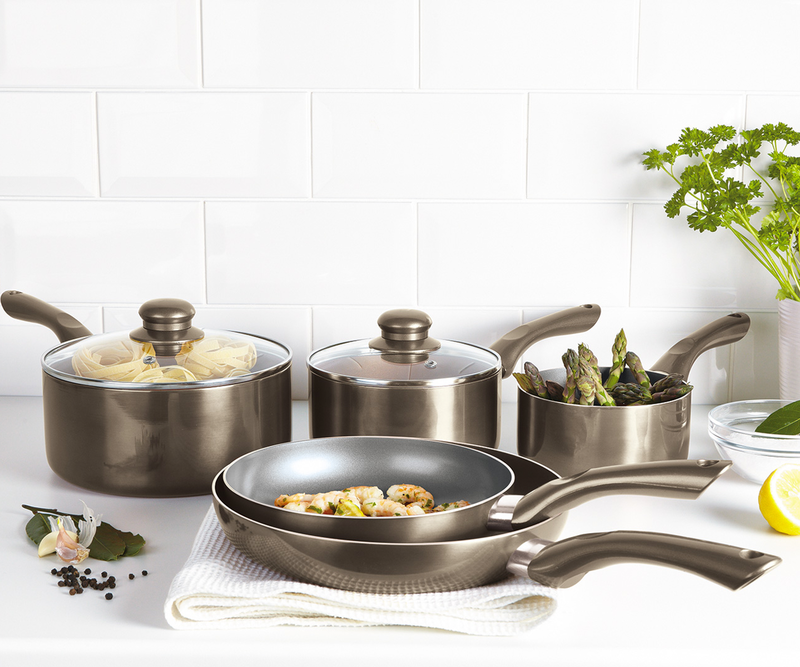 Our 5 piece Cermalon® Ceramic Pewter cookware set with two glass lids follows the latest trend in cookware. Manufactured in high-quality 2.5mm aluminium with an induction base and non-stick ceramic coated interior, this is all the pans you will ever need. This range-topping 5 piece cookware set includes: a small (20x4cm) and a medium (24x5cm) frying pan, a (14x7cm) milk pan and a medium (16x7cm) and large (20×8.5cm) sized saucepan. Glass lids with steam vents are supplied for the 16cm and 20cm saucepans. Our cookware is oven safe to 160ºC and dishwasher safe and suitable for all types of hobs. These ceramic coated pans are PTFE and PFOA free.